***This article was first published in the Huffington Post on Feb. 24. Five Years after Morocco's "Spring" moment, the North African kingdom remains a carefully engineered political edifice where the regime is, for now, virtually uncontested. When the tsunami of the Arab uprisings reached Morocco on February 20, 2011, there was much jubilation and optimism as the February 20 protest movement launched massive demonstrations in Rabat against corruption, economic, and political stagnation. The movement's undeniable feature was that it was born out of several tech savvy youth activists. Using the social media platforms Facebook, Twitter and YouTube, the activists released the movement's founding document calling for a democratic constitution, the recognition of Amazigh as an official language, and the release of prisoners of conscience. In the first protests in Rabat, an estimated 10,000 people took to the streets chanting: "Down with autocracy" and "The people want to change the constitution," and other slogans against the government, corruption and state television. The February 20 movement channeled relative deprivation as a key element in framing its repertoires of contention. The protest movement called for sweeping constitutional changes, reducing the scope of monarchical powers, dissolving the parliament and sacking the government. Some protests even breached the so-called redlines, and called for a republican form of government, and an end to the long monarchical reign. The February 20 movement was initially successful in drawing several groups, and mobilizing a diverse lot of dissatisfied political groups in Morocco from radical leftist Marxists to the banned Islamist al-Adl wal Ihsane, which later withdrew from the coalition of the movement due to defections amidst the leadership of the movement, and state penetration of the movement, in what one activist termed as "the betrayal of the movement" by some key group leaders. Unlike Tunisia's and Egypt's governments' tough stances against protesters, Morocco's monarchy, relying on its socio-cultural capital as a spiritual and temporal purveyor of change and stability, managed to slow the momentum of the protest movement of February 20, by offering a slate of constitutional and institutional reforms. These state strategies quickly closed that cycle of contention that the February 20 movement created in the initial massive demonstrations. The movement never took hold in majority rural areas of Morocco where there was a clear discursive disconnect between the youth's demands in the large urban cities of Rabat, Marrakech, and Casablanca, and rural towns I visited around the greater Marrakech area where absolutely no major protests took place formally or informally. Constitutional reforms, though largely cosmetic, and the election of an Islamist-led coalition government interrupted the momentum and cycle of contention of the February 20 movement. However, it is the protest movement's lack of a contentious cultural frame that proved its most pronounced weakness vis-à-vis the regime's cultural capital. In addition to regime cosmetic constitutional changes, and limited legislative elections, which interrupted the February 20 protest movement cycle of contention, the beleaguered movement was also beset by superior regime cultural frames that effectively impeded the movement's success in its articulation of alternative narratives to the monarchy. Despite some slogans denouncing the monarchy as "rotten", and calling for the downfall of the regime of Mohammed VI, the protest movement did not manage to articulate a strong alternative discourse to that of the monarchy, especially in its traditional and religious appeal. The Moroccan monarchy is deeply rooted in society, in terms of both political culture and institutional reach. This, in turn, may be related to the depth of its perceived legitimacy, political manipulation, coercion, and patronage. Regime monopoly over the religious sphere is also an added advantage that has inoculated the institution of the monarchy against challenges from opposition forces. The monarch is considered the protector of the faith; a royal prerogative codified in the Moroccan constitution and monitored by the state through the Ministry of Islamic Affairs, which supervises the mosques, religious institutions, and appoints imams. The monarchical interpretation of Islam dominates Morocco's political discourse and religious legitimacy is the basis of the power of the monarch. The centrality of the monarchy in the religious realm has led to the monarch's dominance of religious discourse. Faced with a carefully crafted regime traditional-Modern institutional symbiosis, February 20 movement has largely been limited. The mistakes of Feb. 20th movement were also compounded by its lack of organization and coherent protest strategy. One early striking, but constant feature of the Feb. 20 movement, was its fragmented centrifugal leadership, and horizontal mobilization. Several of its members disagreed on the strategy and goals of contestation, while the withdrawal of the popular banned Islamist movement of al-'Adl dealt it a fatal blow. The February 20 movement has largely failed as a transformational social movement capable of articulating an alternative discursive and coherent challenge to the regime. The movement's cycle of contention and cultural frames were nullified by state institutional, constitutional maneuvering, and by a superior regime cultural frame. Ideological fissures amplified the February 20 movement's weakness, lack of consistent contestation strategy, internal disorganization, state penetration, and co-optation. In many ways the monarchy's apparent "success" in weathering the tempest of the Arab revolts is also a function of the weakness, and manipulation of local protest movements. 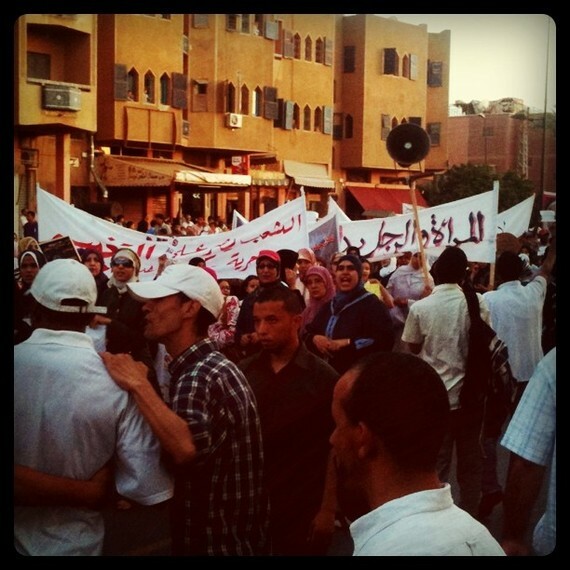 Despite the failure of the February 20th movement, it has managed a slight discursive silver lining as it has elevated the anti-regime narrative to include dissent in areas previously considered taboo by the state in Morocco. Regime constitutional and institutional changes have failed to lift a prevalent trend of public cynicism. Nor have they ushered in a new era in Moroccan politics as many had anticipated. More alarmingly, the last three years have not brought about substantial improvements to the individual and group freedoms in Morocco. Public dissent of government is restricted, and freedom of the press has not been relaxed in regard to previous taboos and red lines, especially as the kingdom faces dire economic challenges, and a rapidly changing regional security climate.